Approximately 18 children in the US die each day from sepsis.1 This is more than all childhood cancers combined!1 Children with sepsis require quick diagnosis and rapid treatment, and the time urgency is likely even greater for children than adults. Kids may present with subtle signs of sepsis, such as tachycardia, delayed capillary refill, and either agitation or lethargy, but may quickly progress to septic shock. Hypotension is a late finding that can signal impending cardiovascular collapse and requires immediate intervention. What tools do we have to react quickly when encountering a critically ill child with hypotension? How can we make sure we give that child the best chance for a positive outcome? Let’s consider a recent case from a large community ED. A 6-month-old infant with a two-day history of viral symptoms was found by his mom gray and unresponsive in his crib. Mom called 911 and started CPR. EMS found the child mottled and unresponsive with a heart rate of 230 and a palpable femoral pulse. A 22G IV catheter was placed and two doses of adenosine were given for suspected SVT, but this resulted in no heart rate change. On arrival to the ED, his temperature was 101.6 F, his heart rate was 245 bpm, and he remained unresponsive with a capillary refill time of > 4 seconds. After a third dose of adenosine, his IV infiltrated and several additional attempts were made to establish better access. The patient then developed apparent seizure activity, with eye deviation and symmetric twitching of all extremities. Initial BP was 92/52 mmHg but quickly dropped to the low 70’s. An ABG revealed a pH of 6.7 and lactate of 9 mmol/L. Bedside ultrasound showed a hyperdynamic heart with subjectively normal heart function and complete collapse of the inferior vena cava. Based on the ultrasound findings and lack of response to adenosine his presumed diagnosis was changed from SVT to septic shock. After IV access was re-established, a bolus of 40 mL/kg of normal saline was infused with LifeFlow® through a 22-gauge IV catheter in the right antecubital vein in less than 5 minutes. This led to an immediate decrease in HR to 170 bpm. He was then electively intubated due to shock, altered mental status, and presumed seizures. An additional 160 mL/kg of normal saline was infused with LifeFlow in 40 mL/kg increments, after which perfusion and vital signs improved. No vasopressors were required. Lactate decreased to < 2 mmol/L in 4 hours, and serum creatinine decreased from 1.1 to 0.4 mg/dL within 12 hours. He was extubated within 48 hours and was neurologically normal. This child presented in septic shock with severe tachycardia, altered mental status, poor capillary refill, and ultimately seizures. The seizures were presumably due to CNS hypoperfusion, which is remarkable given the lack of initial hypotension! He was at immediate risk of respiratory and cardiac arrest. After hypovolemia was diagnosed by IVC ultrasound the ED providers were able to react quickly and provide sufficient volume resuscitation to safely intubate. Hypotension is the biggest risk factor for peri-intubation cardiac arrest,2-5 and while this child clearly needed an advanced airway, rapid restoration of intravascular volume was essential to proceed with a safe intubation. He then continued to receive enough volume (200ml/kg total) to reverse shock and restore normal perfusion, preventing the need for vasopressors and minimizing time on mechanical ventilation. What were the key tools and decisions in this case? For me, one was ultrasound. Bedside ultrasound allowed the providers to quickly evaluate the intravascular volume and heart function, changed the presumed diagnosis from SVT to septic shock, and provided the confidence that the shock was not due to myocarditis and heart failure. Ultrasound then provided continued assessment of intravascular volume by following IVC collapsibility and allowed the team to continue to titrate boluses until his perfusion improved. Decreased HR, improved capillary refill, increasing urine output, and dropping lactate provided confirmation that his shock had been successfully treated. Interestingly, a recent study of ultrasound-guided shock resuscitation fits well with this case.6 Investigators randomized children with presumed septic shock to ultrasound-guided delivery of fluid boluses or standard care. Fluid boluses were stopped and vasopressors started when IVC collapse of <50% was noted. Children in the ultrasound-guided-arm had quicker resolution of shock, received more resuscitation fluid in the first hour, less total fluid in the first 24 hours, had fewer signs of fluid overload, had earlier initiation of vasopressors when necessary, and had shorter PICU length of stay and a trend toward improved mortality.6 An easy-to-use and objective measure of intravascular volume status led to quicker and more targeted resuscitation and improved outcome. There are many reasons that we have difficulty providing adequate fluid resuscitation in children with shock. Probably the most common barriers are the slow and inefficient methods we use, including IV pumps, pressure bags, or the push-pull syringe technique. A second reason may be the lack of understanding of the septic shock guidelines and the evidence suggesting adherence to guidelines improves patient outcomes. And a third may be fear of causing fluid overload. 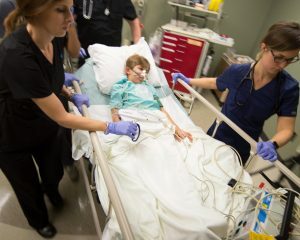 An ideal fluid delivery technique is one that sets up easily, delivers an initial fluid bolus in minutes, allows quick reassessment of patient response, and can be used in any clinical environment (EMS/transport, ED, or in the hospital). The LifeFlow device used in this patient enabled the providers to rapidly and simply deliver fluid boluses to restore and maintain adequate perfusion. The effectiveness of the resuscitation produced immediate and significant clinical changes which enabled quick bedside reassessment after each bolus so that the optimal amount of fluid could be titrated to the patient’s condition. Playfor S. Management of the critically ill child with sepsis. Continuing Education in Anaesthesia Critical Care and Pain. 2004;4:12-15. De Jong A, Rolle A, Molinari N, Paugam-Burtz C, Constantin JM, Lefrant JY, Asehnoune K, Jung B, Futier E, Chanques G, Azoulay E, Jaber S. Cardiac Arrest and Mortality Related to Intubation Procedure in Critically Ill Adult Patients: A Multicenter Cohort Study. Crit Care Med. 2018;46:532-539. Heffner AC, Swords DS, Neale MN, Jones AE. Incidence and factors associated with cardiac arrest complicating emergency airway management. Resuscitation. 2013;84:1500-1504. Kim WY, Kwak MK, Ko BS, Yoon JC, Sohn CH, Lim KS, Andersen LW, Donnino MW. Factors associated with the occurrence of cardiac arrest after emergency tracheal intubation in the emergency department. PLoS One. 2014;9:e112779. Schwartz DE, Matthay MA, Cohen NH. Death and other complications of emergency airway management in critically ill adults. A prospective investigation of 297 tracheal intubations. Anesthesiology. 1995;82:367-376. El-Nawawy AA, Abdelmohsen AM, Hassouna HM. Role of echocardiography in reducing shock reversal time in pediatric septic shock: a randomized controlled trial. J Pediatr (Rio J). 2018;94:31-39. Davis AL, Carcillo JA, Aneja RK, Deymann AJ, Lin JC, Nguyen TC, Okhuysen-Cawley RS, Relvas MS, Rozenfeld RA, Skippen PW, Stojadinovic BJ, Williams EA, Yeh TS, Balamuth F, Brierley J, de Caen AR, Cheifetz IM, Choong K, Conway E, Jr., Cornell T, Doctor A, Dugas MA, Feldman JD, Fitzgerald JC, Flori HR, Fortenberry JD, Graciano AL, Greenwald BM, Hall MW, Han YY, Hernan LJ, Irazuzta JE, Iselin E, van der Jagt EW, Jeffries HE, Kache S, Katyal C, Kissoon NT, Kon AA, Kutko MC, MacLaren G, Maul T, Mehta R, Odetola F, Parbuoni K, Paul R, Peters MJ, Ranjit S, Reuter-Rice KE, Schnitzler EJ, Scott HF, Torres A, Jr., Weingarten-Abrams J, Weiss SL, Zimmerman JJ, Zuckerberg AL. American College of Critical Care Medicine Clinical Practice Parameters for Hemodynamic Support of Pediatric and Neonatal Septic Shock. Crit Care Med. 2017;45:1061-1093. Chameides L, Samson RA, Schexnayder S, Hazinski MF, eds. Pediatric Advanced Life Support Provider Manual. Dallas, TX: American Heart Association; 2016. Carcillo JA, Kuch BA, Han YY, Day S, Greenwald BM, McCloskey KA, Pearson-Shaver AL, Orr RA. Mortality and functional morbidity after use of PALS/APLS by community physicians. Pediatrics. 2009;124:500-508. Balamuth F, Weiss SL, Fitzgerald JC, Hayes K, Centkowski S, Chilutti M, Grundmeier RW, Lavelle J, Alpern ER. Protocolized Treatment Is Associated With Decreased Organ Dysfunction in Pediatric Severe Sepsis. Pediatr Crit Care Med. 2016;17:817-822. Akcan Arikan A, Williams EA, Graf JM, Kennedy CE, Patel B, Cruz AT. Resuscitation Bundle in Pediatric Shock Decreases Acute Kidney Injury and Improves Outcomes. J Pediatr. 2015;167:1301-1305 e1301. Carcillo JA, Davis AL, Zaritsky A. Role of early fluid resuscitation in pediatric septic shock. JAMA. 1991;266:1242-1245.